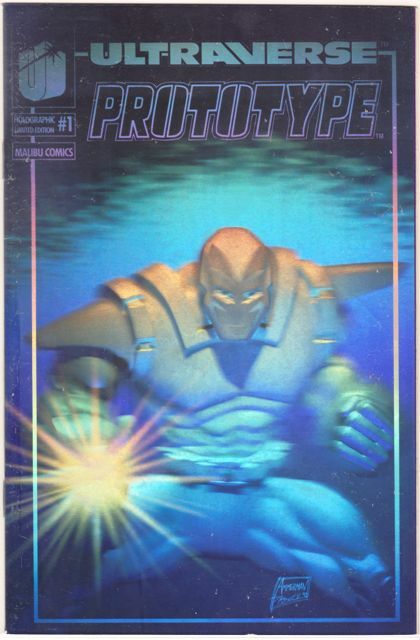 As far as Ultraverse comics go, the silver hologram covers were the bee’s knees. I would have been stoked to find one of these for under $50 back in 1994. Now I wouldn’t pay $50 for a set of all seven ($40, tops). I still think they are very cool and I have picked up a bunch over the years, it’s just that you don’t have to pay that much for them (just ignore all those BINs for $20 and up on eBay). It’s very easy to pick up individual copies for under $10 shipped, sometimes half that much. Just make sure the person you’re buying from has a decent rating and reliable shipping feedback. 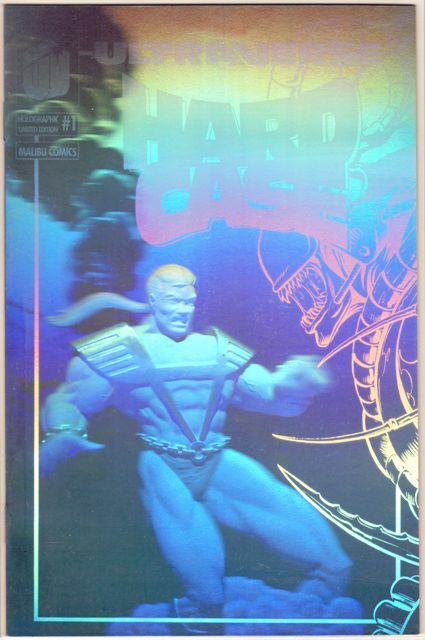 Hologram covers are easily damaged and once they have a ding or a few crinkles they don’t look nearly as nice. I won a lot of all seven for $20 once, and somebody in the post office must have dropped the envelope on its corner, because all seven books had a massive ding in the same spot. Ruined. And they appeared to be pretty much in near mint condition beforehand. 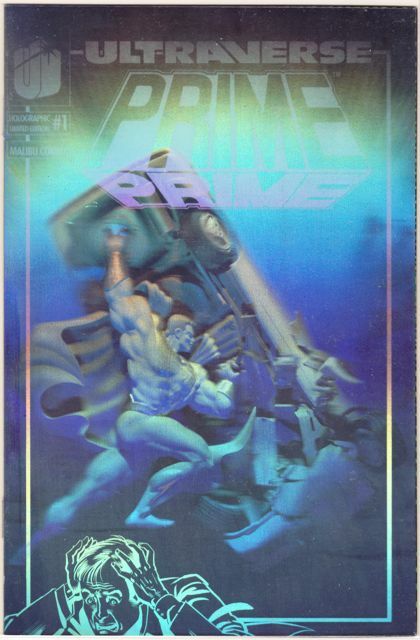 I looked like that guy in the bottom left of the Prime cover (above). Actually, these books aren’t that rare. 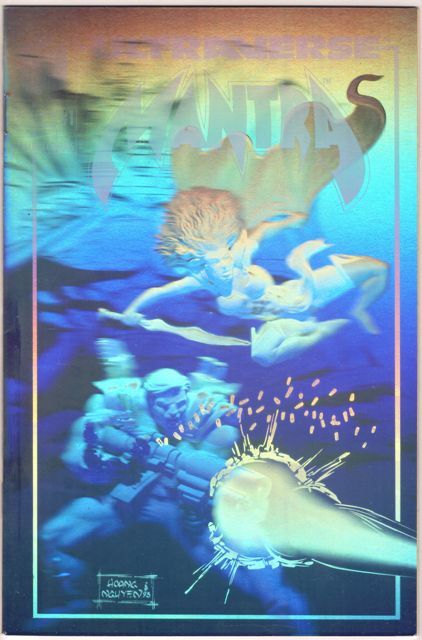 There were 5,000 copies printed of each for a total of 35,000 (not counting 5,500 for the gold Ultraforce comic or the seven gold hologram versions — no idea of the print run on those, probably not very high). But for eye appeal, you can’t beat them. Any self-respecting Ultraverse collector should nab a full set of these. 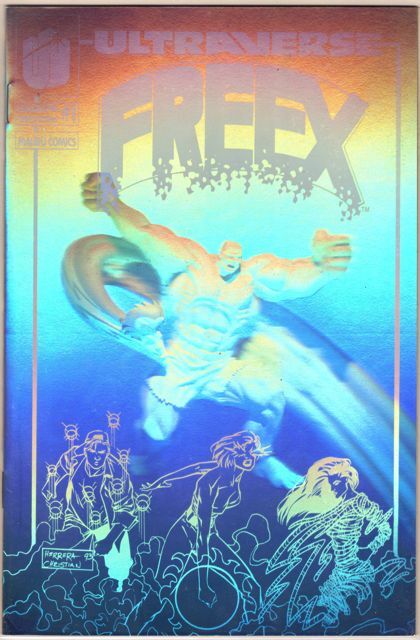 This entry was posted on Monday, June 6th, 2011 at 1:46 am	and tagged with Exiles, Freex, Hardcase, Holograms covers, Holographic covers, Mantra, Prime, Prototype, Strangers, Ultraverse and posted in Hologram covers, Premium books. You can follow any responses to this entry through the RSS 2.0 feed. 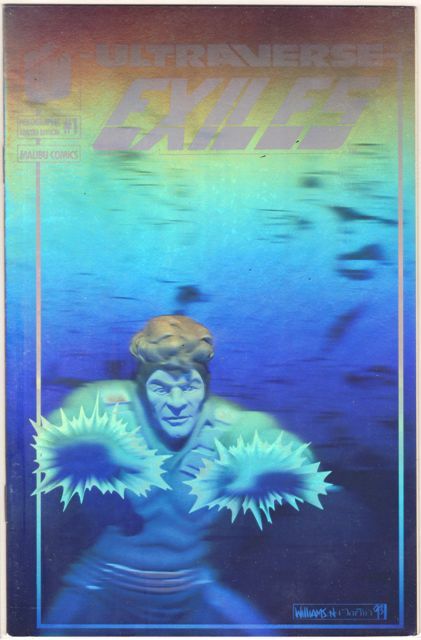 As I have said before, I believe the print numbers are now much lower than the ‘surviving’ number of issues still around as when Malibu/Ultraverse was bought by Marvel back in the day, many ‘left over’ items were offered up to the departing Malibu/U-Verse crew. Some things were taken but all items not claimed were put into a big bonfire and went up in smoke. I think some of these books are rarer than some may think. Of course, nothing is ‘rare’ if nobody wants them.